Monday March 25th 1895 It was a terribly unpleasant day. the wind blew the dust till the sun was obscured. I was busy with the work all the forenmoon and sewed some after dinner. I fixed barrels and set a couple more hens. Will began to cut the [slaths?] today. He went to Coralville for feed in the afternoon. Tuesday March 26th 1896 We went done to Aunt Ems for the turkey hen this morning. I got dinner as soon as I got home. In the afternoon Will went over home for some gates for his pig pen and brought the fence fron the place in town. I washed a few things and churned. Wednesday March 27th 1895 It weas a real nice day. I did the ironing in the morning and the mending in the afternoon. Hattie & Fanny brought the baby out for the afternoon. I wrote a letter to David Fitch in the evening. 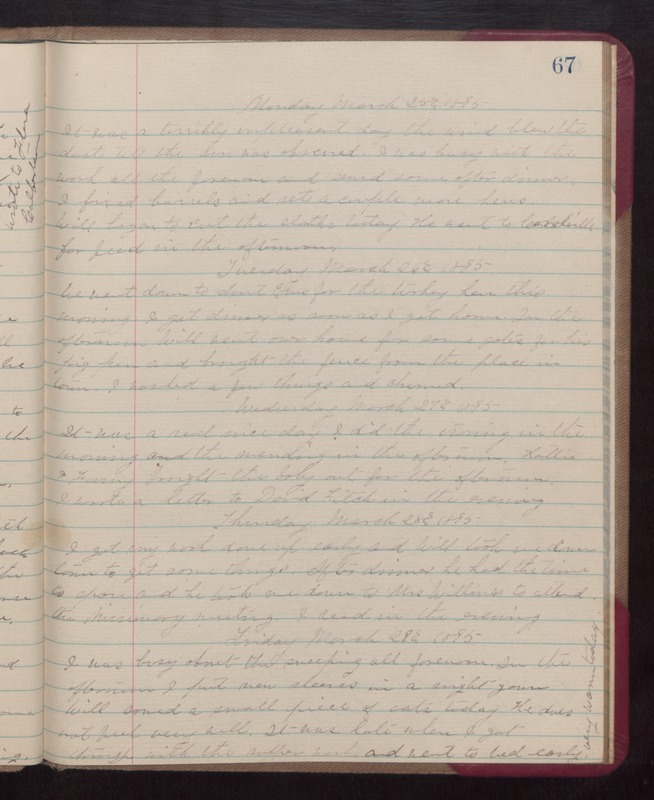 Thursday March 28th 1895 I got my work done up early and Will took we done town to get some things. After dinner he had the time to spare and he took me down to Mrs Williams to attend the Missionary meeting. I read in the evening. Friday March 29th 1895 I was busy about the sweeping all forenoon. In the afternoon I put new sleeves in a night gown. Will sewed a small piece of oats today. he does not feel very well. It was late when I got through with the supper work and went to bed early. [the following text in written vertically in the right margin of the above entry] very warm today.